Steve Vai has released a music video for “Dark Matter” via his Official YouTube Channel SteveVaiHimself today. View the video on KNAC.COM HERE. Vai teamed with Blackmagic Design, Moai Films and director Lukas Colombo on the video, with Moai Films producing. “Dark Matter” is one of the songs from Modern Primitive, a collection of previously unreleased material delivered in tandem with Passion and Warfare 25th Anniversary Edition by Sony Music Entertainment and Legacy Recordings. The “Dark Matter” video was shot entirely on green screen utilizing a full Blackmagic Design pipeline, including editorial, visual effects using URSA Mini Pro and finishing in DaVinci Resolve 15. Blackmagic Design, with offices in USA, UK, Japan, Singapore and Australia, creates the world’s highest quality video editing products, digital film cameras, color correctors, video converters, video monitoring, routers, live production switchers, disk recorders, waveform monitors and real time film scanners for the feature film, post production and television broadcast industries. Long known as one of the top guitarists in the world, Vai has won three Grammy Awards and worked with artists such as Frank Zappa, David Lee Roth, WHITESNAKE, and a myriad of others. Vai’s Passion and Warfare album is considered one of rock’s landmark albums. Vai, who hosted the Big Mama Jama Jamathon — a 53 1/2-consecutive-hour event at Musicians Institute in Hollywood to benefit non-profit foster care and adoption agency Extraordinary Families — with guests such as Dave Navarro, Moby, Orianthi, Al Di Meola and Dweezil Zappa, Sept. 28-30 will continue to have a busy fall season. 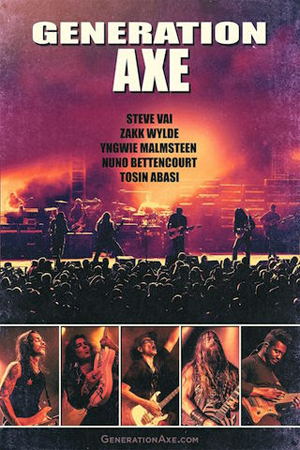 Vai will perform his own compositions with the Alabama Symphony Orchestra (Carlos Izcaray, Conductor) in Birmingham, AL at UAB’s Alys Stephens Center on Nov. 2, before joining Zakk Wylde, Yngwie Malmsteen, Nuno Bettencourt, and Tosin Abasi in the supergroup GENERATION AXE for a 32-date tour of North America, beginning November 7 at the Fox Theater in Oakland, CA. "The GENERATION AXE show is a unique performance of five fiercely talented guitar players coming together to create a 6-string extravaganza that is sure to amaze and delight,” Vai said.